1. 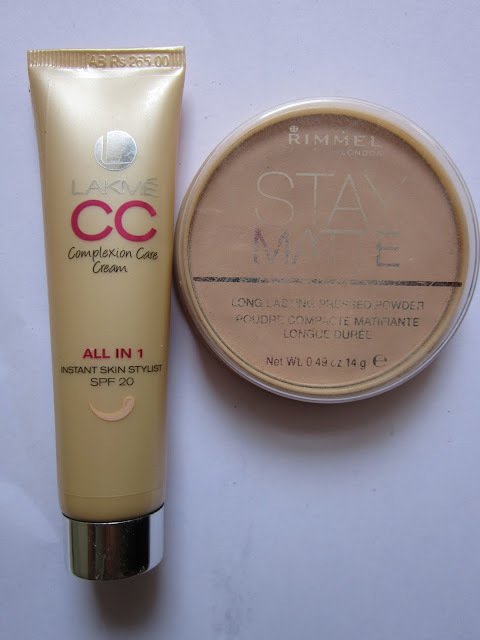 For the base, I used my all time favourite, Lakme CC Cream in Bronze. To set this, I used the Rimmel London Stay Matte Powder in 005 Sily Beige (read review HERE). Along with the CC cream, the powder too, has become a staple in my kit. 2. Using any black kajal pencil, make a thick line on your upper eyelid (make this where you'd place your liquid eyeliner). 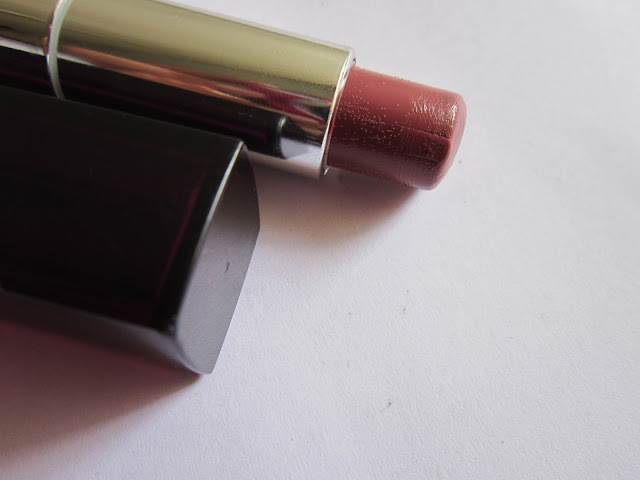 Some good kajal options available are the Lakme Eyeconic Kajal in Black, Maybelline Colossal Kajal, Loreal Paris Kajal Magique or the Lotus Herbals ColorKick Kajal (read review HERE). Blend this with your ring finger across the moving part of your eyelid. The ring finger has the least amount of pressure and wont harm the eyes or skin. You can also use a small blending brush if you wish to. This is now the 'base' for the smokey eyes. 3. Apply a small amount of green/khaki eyeshadow on inner 2/3rds of your eyelid. Top this off with some blue eye shadow to get a good mix. 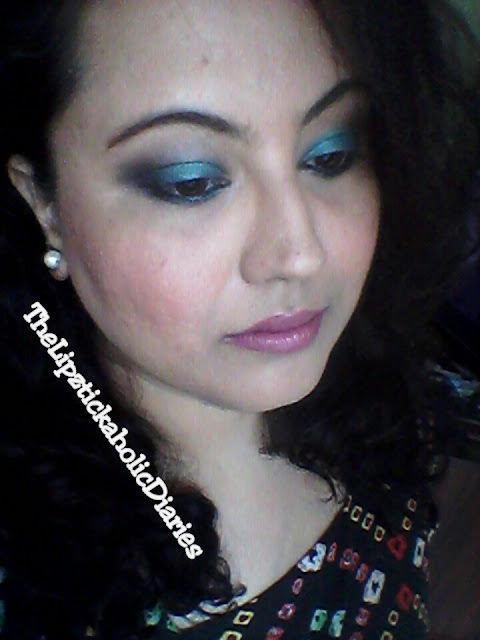 Since I was aiming for Teal, I mixed these two shadows - Revlon eyeshadow link in Khaki & a Blue eye shadow from the BoraBora quad that I received in my Fabbag (See another look with it HERE). If you wish to keep this all one colour then, apply whichever shade that you want. 4. On the outer 1/3rd of the eyelid, apply a matte black eye shadow. 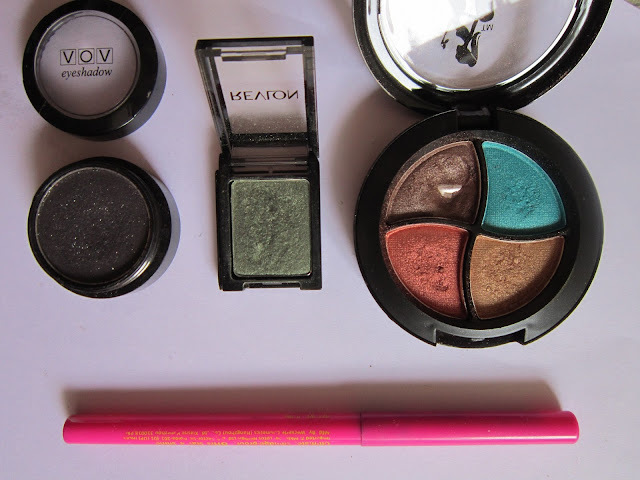 I used my trusty VOV matte eyeshadow in Black. Blend this color inwards, towards the blue shade, till they appear to blend together, dont mix them ;-) just make them look like they come together to blend at one point. Using whatever little black is left on the brush / finger, use this in the crease of your eyelids. 5. Use Kajal again on your lower lashline & smudge this out with the blue to complete the look. To finish off the look, I applied the Calvin Klein Mascara on the lower and upper lashes. Wait, before you judge me, let me clarify that I'm a budget-product junkie & this CK Mascara came to me in a makeup swap lol :-P Moving on...I chose to skip liquid eyeliner that day as I wanted to keep the look undefined, but you can line your eyes if you wish to. Sorry, I couldnt seem to find the blush while clicking pics, but you can see it HERE. 6. 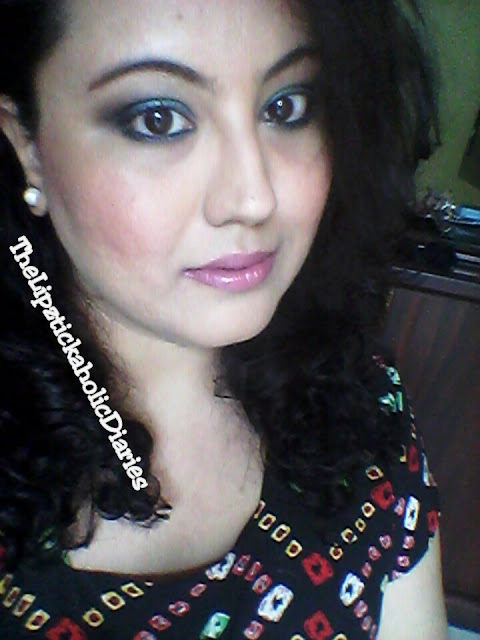 For blush, I used my current favourite, the Lakme 9 to 5 Blush in Peach Affair. This is a beautiful, peachy blush for fair to medium skin tones & goes with mostly any kind of look. For the lips, I wanted a subtle shade so I used the Maybelline Colorsensational Lipstick in 405 - Yummy Plummy. Hi Neha, this is a very pretty look. I'm definitely going to try this. Thanks for sharing. I'm loving the Teal smokey eye make up of yours. You look great girl. Thanks Chaicy! So sweet of you :-) You blog is so interesting & versatile!